I’ve adopted the “Six Aspects of Denial” from Sean B. Carroll’s book “The Making of the fittest”. I regard these as the most common non-scientific objections to the science of climate change. Actually, I will be so bold as to say these six “aspects” are pretty the core arguments of the denial movement. I hope this framework helps people understands the flawed logic behind the arguments used by the denial movement. Doubt the science – This is the standard tactic of all denial movements. Creationists attack evolution and geology as they contradict the belief a god/s created the world just under 10,000 years ago. Alternative health practitioners claim the science that demonstrates the lack of effectiveness of their treatments is at fault. On web sites, in books and on internet forums deniers attack the science by cherry picking data, misrepresenting research or making bogus claims. Question the motives and integrity of scientists – This is the favourite tactic of the climate change denial movement. They claim the scientists are engaged in fraud, or are being pressured by governments to make up the results. They make up vast conspiracy theories in order to cast aspersions on the motives of climate scientists, physicists and biologists whose work confirms the reality of climate change. They use the “follow the money” argument, stating scientists are making up climate change in order to get research funding. All of these are simply ad hominem attacks: playing the man. Magnify disagreements among scientists and cite gadflies – Again, one of the favourite tactics of the denial movement. The tiny percentage of actual scientists who express scepticism (Plimer, Lindzen) are dwarfed by the thousands of scientists who agree with the consensus that climate change is happening. But the denial movement exploits the media’s tendency to present “both sides” of the argument and thus help perpetrate the myth scientists are still debating climate change when in fact there is near unanimous agreement. Exaggerate potential harm – This normally takes the form of “harming” the economy if the government intervenes. This is why opposition to cap-and-trade (or emissions trading schemes) are anathema to some parts of the denial movement. They also claim a climate change is an excuse to usher in a “world government”. The denial movement plays up to these fears, playing on the anxiety that they will lose their freedoms (see below). Appeal to personal freedom – One of the great fears of the denial movements is a loss of freedom. Whether economic or political, they have a paranoid fear that someone (government, scientists, greens, politicians) are going to restrict their right to unlimited consumption or their freedom of speech. But reality is not a democracy. We don’t get to choose the truth about climate change, just as a popular debate about evolution does not decide the scientific facts. The denial movement loves to frame this as a “debate” when none exists, claiming they have a right to doubt the science. Of course they do. But it does not mean they are correct. Acceptance repudiates key philosophy – For libertarians and free market advocates, climate change is a direct challenge to their assumption of unlimited growth. Any response to climate change will involve government intervention and global governance structures (such as a binding treaty to limit CO2 emissions). To such ideologues, it is axiomatic that such responses are “bad”. And yet the “market” can’t fix climate. Caught between accepting the science and what it entails and rejecting it in favour of their faith in the market, they reject the science. The same could be said of religious conservatives: like evolution, climate change is a direct challenge to the idea that a god/s has a governance role and is directly responsible for managing the day-to-day affairs of the world. That a god/s would let climate change happen and not intervene is deeply challenging to the idea that a) they would allow such “evil” and b) the god/s is omnipotent. do you deny that the MWP was warmer? do you deny that CO2 follows temperature? But I predict that AGW opponents will continue to be highly disappointed and that the new openness will strengthen AGW rather than torpedo it. This paper is a perfect example of just how absurd one can get in starting off with a conclusion then seeking to verify it. Have you worked out yet why each incremental increase in temperature requires a doubling of CO2 – thus implying that there is a limiting value beyond which increase in CO2 will make progressively more infinitesimal difference, John? Oh, and why this has no relationship whatsoever with carbonate-bicarbonate buffering? I must say, it’s quite amusing being lectured on atmospheric physics by someone who hasn’t the first understanding of MODTRAN. you cannot even understand that this only applies to CO2, the feedbacks could end up giving you a bloody lot more temperature increase from the first doubling alone to cause very dangerous warming , are you really this ignorant? Yes the roughly logarithmic nature is well known. So the consensus estimates are that the first doubling, from around 280 pre-industrial to 560 ppm, would likely raise the average temperature by 2-4.5 degrees C (from that baseline). Some hope for less than this range (CO2 alone with no feedbacks is about 1.2 degrees per doubling); some are concerned that it could well be higher than this range. If net feedback was a simple multiplier, then another doubling to 1100 or so would be required to raise it another 2 – 4.5 degrees. And yet another to raise it an additional increment. We do all understand that, catweazle – you don’t need to give yourself airs because you successfully at least partially grasped step one of the analysis. But I think your mathemetics are a bit rusty tho. Logarithmic functions are not asymptotic as you imply, they do not converge to any “limiting value”, nor is there even any “knee” to the curve. If you can make reference a “limiting value”, then you haven’t yet really fully grasped what a logarithmic curve means. But that’s not the largest problem with your description. In this simplified abstraction, do you understand that Business as Usual has also historically tended to foster roughly exponential growth in greenhouse gas emissions (because of near exponential growth in world population and in per capita emissions)? If emissions were an exponential function of time, and temperature rise was a logarithmic function of those emissions, then temperature would be a linear function of time. The real world is more complex. The heating is (roughly) logarithmicaly proportional to the atmospheric CO2, but only about half of emitted CO2 has been retained in the atmosphere so far, the other half going into sinks like the ocean. As our emission rate grows and the sinks become saturated, atmospheric CO2 will rise faster than a linear function of emissions. Emissions may rise faster or slower than exponentially, if we get off the BAU curve. That could be due to policies of various sorts, or economic problems, or changes in energy efficiency, or changes in fuel source, or changes in population growth rates, for example. Currently, the US is shifting towards using more (fracked) natural gas (which has about half the CO2/energy emissions of petroleum) which can lower the curve; if we are forced to shift to coal without effective carbon capture, that would raise the curve because it’s worse than petroleum. The US and Europe are also increasing energy efficiency, which helps. And we will be running low on affordable fossil fuels of all sorts (including coal unconventional ones) in this century, which will slow usage. If the net rate of buildup of CO2 in the atmosphere is higher or lower than exponential with time, then temperature rise may be more or less than linear with time. In fact, the goal of emission reduction is to make temperature rise less than linear and eventually stable or reducing back to better levels in the long run (as well as limiting acidification of oceans, etc). And of course, it’s not simply temperature per see that affects is – it’s the cascading effects – precipitation changes, extreme weather, ecosystem damage, infrastructure damage, agricultural effects, etc. These will not likely be linear. The second two degrees of rise will not have the same effects on human civilization as the first two degrees of rise, and most analysis expect increasing effects (possibly even some “tipping points” or knees in the curve). So even a linear increase in temperature cannot be safely assumed to mean linear increase in the net effect on humans. Even a 1% change in the mean absolute temperature of the earth – up or down – can mean drastic changes in the ecosystems and biosphere. The effects on life are not anywhere near linear. And within the human (vs natural) sphere, there may be non-linear cascading effects. If a society is faced with dealing with too many challenges at once (crop failures, sea level rise, environmental refugees, resource wars..) its economy could collapse rendering it less able to adapt to the climate changes still in the pipeline (eventually a collapsed economy could bring reductions of course). I have no doubt that the planet’s temperature will eventually recover balance, my concern is what happens to human civilization in the next few decades and centuries. Keeping a global economy functioning and feeding 7 billion people puts us way out on a limb, and the path downward from that situation could be a grim one. In the face of all that, it would take a remarkably shallow systems analysis to believe that the known logarithmic relationship between atmospheric CO2 levels and temperature rise, provides any meaningful reassurance (even setting aside the misunderstanding of there being a limiting value in the logarithmic curve). Then there is the feedback from methane, over 150 times as potent as CO2 upon emission. CO2 is up about 67 percent from baseline. Methane is up over 250 percent. N2O is even more potent and rising, too. CO2 is only the lanyard. Methane is the howitzer. It is implicated in the Great Dying…… the End Permian Mass Extinction. Everything that increases the average surface temp. and the lower troposphere heating will increase water vapor content of the air (now up almost 7 Percent from baseline) and further heating of the biosphere. 1. Global warming is not happening. 2. Global warming is not man-made. 3. Global warming is not significant. 4. Global warming is not necessarily bad. 5. Global warming is not a problem. 6. Global warming is not worth fixing. There is too much conjecture in climatology to live our lives round minor mean global temperature variations caused by mutiple influences. BTW who is Henson? Do you mean Dr James Hansen, notorious climate alarmist, by any chance? No. It’s there in the comment. He means Robert Henson, who wrote “The Six Pillars of Climate Change Denial”. I nominate you for the lamest gotcha of the year. zoot…sorry, I have never heard of this Henson guy or anyone else writing such blatant propaganda as “The Six Pillars of Climate Change Denial”. Who is this person denying climate change anyway? No need for ad homs either, zoot, just because I am not aware of every propagandist promoting the weak CAGW hypothesis using irrelevant wording. You are not on some sort of religious crusade are you with me as the heretic who has not read your bible? I have read Nicky Stern’s gross exaggeration and distortion of the IPCC 2007 findings, if that’s any good. so reality is most likely a catholic in the mould of Pell. reality is not a real scotsman ? Or do you mean argumentum ad hominem? I love this stuff. Its like religion – AGW is just too big and generates too much money for too many people to stop. If you tell a religious person that there is no evidence that God exists, they just revert to “having faith”. And no amount of lack of evidence for AGW will stop them having faith. Its the ultimate irony – big business making money out of socialists who hate them. why the “awaiting moderation” ?? the Daily Telegraph does not do that. Afraid of commentary that does not fit your worldview..
…nor am I moderating this blog 24/7. Its part of a global conspiracy to stifle debate from real skeptics. Don’t trust the warmavista. They want to rule the world. Ever looked at the obvious disconnect between atmospheric CO2 and mean global temperature over the last 150 years and what it means? 1997 to 2011 experienced 15 years flat-lining (cooling since 2002) with atmospheric CO2 increasing at the rate of 2.06 ppmv pa (more than at any other time post 19th century). 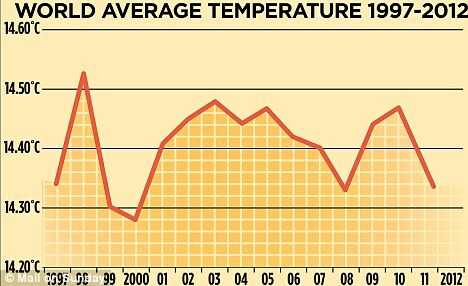 It is also important ti note that the Met Office (HadCRUt) recently released figures showing that the mean global temperature averaged over 1997 was 14.34 degrees Celsius, identical to the mean global temperature averaged over 2011. However, atmospheric concentrations of CO2 increased at the highest rate in 150 years over this same period, adding 8% to the 363 ppmv in 1997. This analysis shows that the effect of increased CO2 on global temperature is minor and ~ 60 year natural cycles are in evidence as the primary connection for climate change. Another point of interest that can be readily checked from the official data sets is that the global warming rate of increase from 1860 to 1880 was virtually the same as the rate of increase from 1975 to 1995 (around 0.16 degrees C per decade). This is despite the fact that CO2 was only increasing at 0.22 ppmv pa over the 1860 to 1880 period BUT at 1.48 ppmv pa over the 1975 to 1995 period. Anyone on here spot a few cracks in the alarming global warming hypotheesis?… Not that I expect this to get through your moderation of course as this post is too honest. You have produced a lot of evidence that you have little understanding. you really have no understanding of natural variability, aerosol effects. ENSO effects, volcanic effects, solar effects. and other input on top of the warming signal. you have no understanding that the surface temperature only accounts for 2% of global warming.or where the rest of the heating is going, and to top it off you refer to a newspaper article that does not even support your own claim. you cannot even see the contradictions that your lot produce, claiming that the data is doctored to produce warming. what is that all about then if you claim that the data shows cooling. but good start for someone who may be just confused? put your denial to work on this. OOH looky realityreturns drew a line from the dot at 1998 to the dot at 2011 who would have guessed? must be a statistician? I don’t have any denial. I have honest logic, John. You were going really well really and then you spoiled it it all, it is not called linear regression , it is known as cherry picking. You are presenting talks rather than papers? Accusing the blog owner of being dishonest by filtering what you claim as “honest” posts is not the way to win friends. You will find that Mike actually likes to let what you call “honest” posts in here more than every denier blog many of us have visited do. By the way I noticed that it was much hotter in summer than it was in winter, therefore,my cherrypicked data proves AGW. Of course I don’t have the met office to misrepresent to support my argument….. Anyone interested in the “consensus” ….views from real scientists on all sides of the CAGW debate, btw? I can post it later for you if you like. Hi John, I have tired to post a link to the peer-reviewed science papers you like to follow, apparntly, but it nerver gets through your moderation. It is always best to discuss one at a time in any case, saves confusion unless you just wish to gish gallop? Your views may be considered worthless too you know, John. You have no divine right to be right and in fact you are wrong over the CAGW issue. Conflict of JB’s statements….”links to web sites will be ignored” and “This is not my blog” ….. but you decide how people may post and what links will be ignored …Have you ever understood that you are into dictatorial protectionism of “your” blog from reality and the truth? If this is not your blof then why do you decide the link will be ignored and oddly it will not post? I have a whole load of peer-reviewed scientific papers for you…scared? You can follow them through at will but I don’t think you want to see anything that overturns your religious beliefs….natural I suppose. Tried to posts a single link again but you are blocking me posting the link, aren’t you John? I’ve not blocked anything on this site. One assumes it will the list from Poptech. ,we have been through this so many times it is pathetic. Well it is odd that my link will not post but other links have. I see denailism here over peer-reviewed studies that do not suit the warmist mantra. The jibe at posting study by study will not work if the list link doesn’t. FFS you do get it surely ? Abuse and desperation will get you nowhere, John but I will try to post the web site link again on a new post which you can browse at your leisure if you have time and come back to me on anything in the papers you don’t understand. links to web sites will be ignored, now you have a paper or you do not, which is it? After nearly 24 hours and you can not come up with the DOI of even one paper. Does anyone on here know why there has been no warming for sixteen years? Only, well, that’s not what we were told would happen by the climate scientists and agencies such as the IPCC, Met Office, and, apparently, ‘every scientific academy in the world’ end quote. I think we are missing at least 0.4C of temperature increases according to past predictions. It’s all very well posting articles like this one, which is one long ad-hom against anyone who doubts the ‘science’, but then when the empirical data, both for global temperatures and sea level rise, doubts the ‘science’ then there is a strong suggestion that your ‘science’ is wrong, isn’t there? So a climate science that considers only CO2 as a warming influence, and avoids the more likely influence of solar activity on climate, such as the TSI, and sunspots, needs to start weening themselves off the CO2 meme and consider the suns influence, which I think is a far more likely controller of climate change. Or are the climate scientists sun deniers? What makes you think there has been no warming for sixteen years? It can’t be the temperature record, the record low summer Arctic ice, the retreating glaciers, the melting Greenland ice sheet, the melting permafrost or the high SSTs. If you ignore the deep ocean, where over 90% of the heat has gone, you can almost, not quite, make the assertion. Surface temperature are rising more slowly than they were. But, then, what is your excuse for ignoring most of the data? I have attempted several times to post peer-reviewed papers sceptical of cagw alarm and they will not post here. They post just fine on the DT blog sites. BTW, I deny no more than you do: you dney natural influences as the primary climate drivers and I deny Mann-made influences as the primary climate driver. Do you spot the fatal flaw even in your failed attempts to insult? I do not know how your trick works as I have tried using tiny url susbstitute links for papers and they do not work either. It is not up to sceptics to disprove the weak cagw hypothesis, but up to the warmist cult to prove it. Climategates I & II were not just about fiddling datasets but about deception by the climate cabal using highly dubious techniques to bias the presentation of data to exaggerate and alarm. How was this done? This analysis shows how, with no cheating on the actual dataset figures, the advocates of CAGW have worked, using statistical, graphical and linguistic sleights of hand, to exaggerate the truth so the public see what the cabal want them to see and miss what the cabal don’t want them to see. This is not science; it is PR and shows how a small group of CAGW believers have exaggerated both implicitly and explicitly. Here’s a few examples (from memory, the BEST report does not comment on the presentation in any depth but does mention possible exaggeration of the human element. 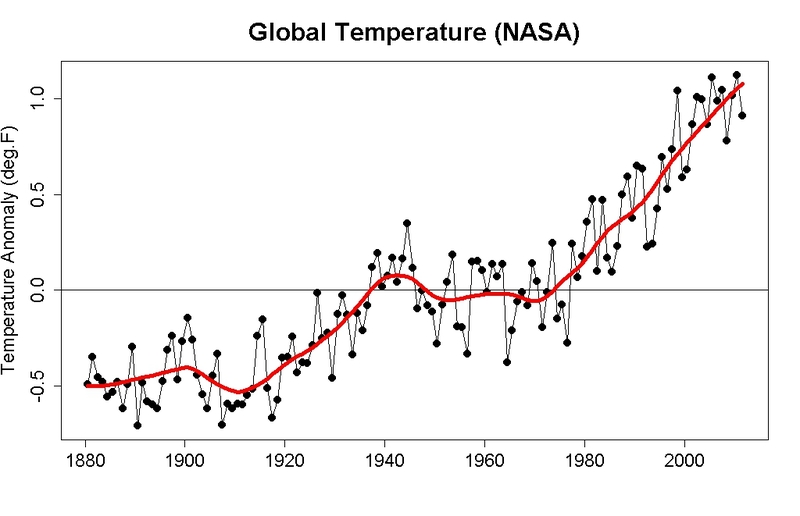 1)	Use the words, “The Planet has been Warming.” Avoid mentioning the fact that this warming is barely detectable at about 0.07 deg C per decade averaged over the entire 20th century but only 0.05 per decade for the immediately past decade. 2)	Avoid scales which show too much detail and use convenient markers (vertical green bars) starting on a low and ending on a high. 3)	State Sea levels are rising but avoid that on average this is around just 1 inch per decade and has been for some time (a little less recently according to Colarado Uni data). 4)	Avoid close-ups of the post 1995 period. If forced to show something on this, avoid all averaging lines or markers that would highlight the flat lining or the marginal downward line since 2002. 5)	Concentrate on absolutes, such as the first decade of the 21st century is the warmest in the past 100 years but ignore step trend change that places it on a plateaux during this period with marginal cooling. 6)	Never show the erratic global temperature profile on the same chart as the steady tight sinusoidal increase CO2 profile such as is shown by sceptics on the Friends of Science website. 7)	Cherry pick timeframes that can adopt the years of strong warming occurring between 1970 and 2000 to project back to years before and on into the 21st century to exacerbate apparent warming in what were in fact cooling and flat-lining years. 8)	Terminology: change the language so that the term global warming or climate change are automatically attributed falsely with the invisible ‘catastrophic’ and ‘man-made’ labels. 9)	Instead of sceptics, use the word deniers to falsely and evilly imply holocaust deniers. Footnote: I am sure that sceptics will see other tricks used as this list is not exhaustive by any means. Post a DOI of just one of the papers in the list dopey. The ultimate Marc Morano’s SPPI appeal to non-authority. Well done. Americans are so paranoid about socialism that they are blind to the fact ther are being manipulated, deceived and controlled by a small group of billionaires who fund the Donors Trust which in turn fund the Cimate Change Deniers. While these individuals are fairly ignorant about the climate science they are far from stupid. They are expert communicators and they know exactly what strings to pull to get the public on their side. They play the politicians and the general people for fools and they get the media to go along for the ride (especially FOX News)! The Climate Change deniers are not at all concerned about the future generations – or even the current generation for that matter – just their own selfish, thoughtless greed. They are manipulating Americans for the express purpose of getting the general public to stop the politicians from doing anything that would effect their life style. In my opinion what these people are doing is unethical and very dangerous. In fact, I think these people are potentiallly more dangerous than the Taliban to America. The Taliban can destroy the lives of hundreds, maybe thousands, but the Climate Deniers be indirectly responsible for destroying the lives of millions, even billions of people not just in the USA but around the world by successfully stopping the steps needed to avert a global catastophy due to climate change. Many of the poorest people on this planet, the ones least able to cope, will be the worst effected. Ultimately, if we continue to do business as usual, wars, even nuclear war, are possible as poorer nations try to protect their people from the effects of climate change – displacement due ot sea level rise, starvation due to more and more droughts and crop failures, etc. Already there are a few millions Climate Change refuges in various part of the world. 25 February 2013 – Environmental concerns among citizens around the world have been falling since 2009 and have now reached twenty-year lows, according to a multi-country GlobeScan poll. The findings are drawn from the GlobeScan Radar annual tracking poll of citizens across 22 countries. A total of 22,812 people were interviewed face-to-face or by telephone during the second half of 2012. Twelve of these countries have been regularly polled on environmental issues since 1992. Asked how serious they consider each of six environmental problems to be—air pollution, water pollution, species loss, automobile emissions, fresh water shortages, and climate change—fewer people now consider them “very serious” than at any time since tracking began twenty years ago. Relevance? People’s opinions have no bearing on what’s going on in the physical world. All you have done is demonstrate what could be known as the 7th pillar of denial. 7. Cite irrelevant or unscientific sources. Godwin’s Law as invoked by “sweet pea” or whoever it was at the link you provided is always a sign of a weak argument. It basically boils down to name-calling. There’s one here at WtD named Eric, who repeatedly compares climatolgists to the eugenicists of the 1930’s. It actually makes me smile because it just confirms for me that he’s an idiot with no argument. However this is the same moderator who thinks explicit graphics of exploding heads in answer to a science based question/discussion is OK. Also that SweetPea’s non-stop flow of vitriol and dishonesty and Goodwin’s ‘syndrome’ is AOK for the circular discussion he seems to prefer. “Pyrrho” – go figure – skepticism for the sake of skepticism is his game. uknowispeaksense thanks for reminding me about Goodwin’s Law. This guy is professor of climate at Macquarie University. !!!!!!!! In any realm of life, calling people names, or making claims that they think are false will only get their backs up. Further blocking them from any access to the media will generate the idea they are a victimized minority. The best public relations present positive images about one’s own ideas. Negative images of opponents always backfire. I have made three suggestions how this might be done. First, loudly proclaim the predictions of climate change that have come true. Second, counteract the claims of pseudo-science by demonstrating that climate science not only builds of the greatest scientists and philosophies of science, but enhances them. Third, disperse the claims about pursuing high-risk policies, by proposing safeguards and audit checks against them being usurped by profiteers and swindlers. Nice comment. Thanks for posting it. Yeah, I can see how popular the North Korean socio-economic ideal is for environmentalists. But I can’t quite see Al Gore/Tim Flannery/David Suzuki as Kim Jong Il (etc), yet. James Hansen, however, is already there. You silly bunny…Every western democracy has adopted measures to address cliamte change, including China (gasp) who has implemented carbon trading measures. You anger shouldn’t be directed at Al Gore –it should be directed at the authors of over 950 peer-reviewed articles that form the 98% consensus. Why do you automatically assume that the opposite of a free market is North Korea? It is a military dictatorship for a start and I’m pretty sure that is as far from the values of the average environmentalist as you can get. However, the main point of this comment was about the “assumption of unlimited growth.” If you have some insight into the Laws of Physics that allows unlimited growth (consumption) in a finite world, we’d all love to hear it. orson well, so you think unlimited growth is possible. . . do you now? I really wonder how those Romans managed to plant wine so far north, and how the Chinese managed to develop chrome without good conditions for cultural and technological growth. Or how the Danes, about 1,000 years ago, planted wine and a certain Murasaki wrote the first novel of mankind in Japan. Let’s see, where’s the wine border in Europe today? Oh, somewhere in Germany. Significantly farther south than 1,000 and 2,000 years ago. Hmmm, what could that mean! Oh I don’t know… maybe that it’s still colder than 1,000 and 2,000 years ago? Even on a global scale? It had to be global, or at least on the northern hemisphere, otherwise we wouldn’t have cultural explosion in Asia and Europe at the same time. No that can’t be! All the computer models say different! Computer models aren’t science. If you believe that a program can reliably foresee a non-linear, chaotic system, then you need a shrink. Those are, btw, the same computer models that can’t even confirm past development with factual data. Yeah, so very reliable. It’s funny how some tree ring data, that was clearly massively manipulated, is gobbled up as fact, while factual archeological evidence is completely dismissed. Happens when “science” is done by desk jockeys. Nov 30, 2008 – The ideal climate for growing grapes can be devided into three components: …. grape wine can grow 700 km from the polar circle in Finland. Wine making…really persuasive evidence. Perhaps such evidence will help you solve the moon landing hoax. Oh dear. See Aspect 1. I have an idea Edohiguma. How about you explain to us all, how the computer models are wrong. There are quite a few readers of this blog who are computer modellers and would be very interested to know which parts of the various programs are incorrect. Be specific now. I’m sure everyone would like you to demonstrate your modelling expertise. Next, how about you demonstrate which part of the tree ring data was “massively manipulated”? Perhaps you can produce your graph that you have produced with that same data that demonstrates that? Finally, you talk about “desk Jockeys”. Well, perhaps you can explain to us all about the dramatic changes in natural ecosystems that are occurring? For example, field biologists and ecologists have recorded range shifts and changes in phenology in tens of thousands of plant, animal, fungi and bacteria species directly attributable to temperature changes. You may be ableto answerthisby saying that it is natural but with that, you must provide a mechanism that explains the increase in temperature. It’s not the sun. It’s not volcanoes. It’s not Milankovitch cycles. What is it? Or perhaps you don’t think the Earth is warming at all? Perhaps you think the slow down in the increase of the land surface temperature record proves global warming isn’t happening. If that’s the case, how do you explain sea level rise? How do you explain the extraordinary melting of the ice cap? So, get your notes together and astound us all with your brilliant scientific rebuttals. More and more I’m thinking that the “Six Aspects of Denial” is missing one most important aspect – that being the ‘willing audience of accomplices’ which has sustained this three decades of dog-chasing-tail denial of facts and strategic attacks on science. What about the “Enablers” of the Denial Machine? Why, in light of all this evidence, does the Republican power-politic global warming denial machine keep churning out distortions, lies and plain old crazy making? By Republican power-politic global warming denial machine I’m referring to the likes of the Marshall Institute, Heartland Institute, SPPI, Murdoch media machine, Morano, Watts, McIntyre, et al. Peddlers of transparent science fiction. What I find most disheartening is that at the heart of this endless flow of calculatedly deceptive stories is the fact that this is exactly what the Republican general public and politicians expect to hear. These are the enablers and they countenance no objectivity or doubt. The Republican and Tea Party public expect to be assured that the 1950s haven’t ended… they reject introspection, and serious scientific investigation, while refusing to face real world challenges barreling down on us – rejecting tons worth of legitimate information with a passionate anger. It’s as though they couldn’t care less about what scientists are actually learning – all they want is soothing bromides that justify their willful ignorance regarding the state of our one and only home planet. In step the likes of Krauthammer, etc. For all appearances this public has abandoned critical thinking skills and the pursuit of genuine learning – in favor of Holly-world storytelling where facts are selected and adjusted to the needs of the story teller’s plot… in this case, that Reaganomics principles reign supreme over all other considerations and that we can disregard our Earth’s processes. Unfortunately, we live on a real planet, a miraculous planet, like no other. Yes, climate has always changed… we also know our climate has been in a few thousands year old “goldilocks zone” enabling a complex society to thrive. Why then, can’t Republicans realize that means this wonderful rare climatic era is most precious and needs to be protected? Very true Pete, and I think it might be time to review/renew this list. Since I wrote it my thinking has become more nuanced and informed. Thanks for the suggestion. I suggest a thoughtful walk to Damascus. My pleasure, looking forward to reading the updated version. It looks like the deniers bailed out about three years ago. After the data we just saw for not only 2015 but for the first two months of 2016, I don’t imagine the deniers are leading with their chins anymore. Tell ya what, this isn’t rocket science. Google Images….. “glaciers then and now”. Now don’t believe your lyin’ eyes, you goobers. My favorite is the Muir Glacier. Wott's up with that: a response to WUWT?